If your iPhone or iPad was connected to free wifi but you don't see any progress at your Safari then this application is for you. Just open this application and press any button and your will see is there real Internet answer at this wifi/mobile network or not. This application was designed for quick checking availability of Internet for not qualified person who doesn't know how Internet is working. Just need to press button and answer will be "Ok" or not "Ok". Very easy. At version 1.5 was added very useful mode - Widget "Today". You can check internet just via one moving of big finger. Open "Today" screen and you will see state of Internet. Of course you need to add this widget to "Today" screen before. But it is very easy as well. 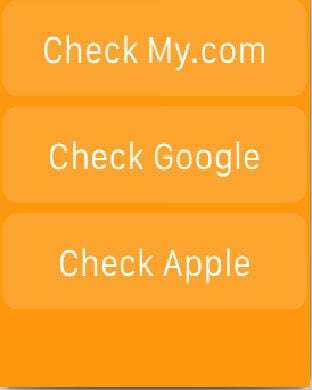 Application gives possibility to check availability of Google site, Apple site, your own site or your wifi router. 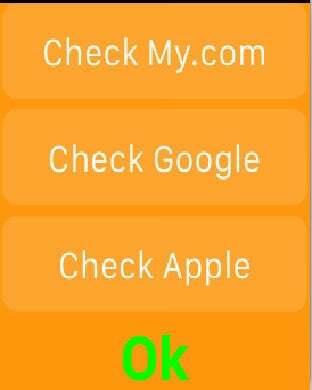 Additionally this application has module for Apple Watch and you can use it for similar easy check. iPhone uses "Ping" technology for check of availability of Internet. Apple Watch uses "Web request" technology for similar checking. At screen below you can see progress of checking. Any comment you can drop to me and I'll happy to modify my application according to your needs. If you don't like background color then just rotate your gadget.